A spark was all that was needed to ignite the strike, and that spark, was Cortonwood Colliery. The decision to close Cortonwood in South Yorkshire came as a shock, not only to the men who worked there, but also to the rest of G.B. as it was the first pit to be listed for closure without consultation. At a meeting on the 21st of March 1983 the N.U.M. and N.A.C.0.D.S. had been informed that the pit would be kept open till 1989. A further meeting on 22nd April, with higher coal board officials present, that pledge was repeated. 80 miners from Elscar colliery, just 2 miles away were transferred to Cortonwood and guaranteed work for several years. In 1983 the Coal Board spent £1 million to improve the coal washer at the colliery and installed a new generating plant at the cost of £100,000. An additional £40,000 was spent on improving the pithead baths. The modernisation scheme was completed shortly before Christmas 1983. So when George Hayes, the South Yorkshire area director, announced the closure on March 1st 1984 without reference to the colliery review procedure, that was jointly agreed by the Unions and the Board in 1973. The miners were convinced that the pit had been singled out for special provocative treatment at the hands of people in a much higher post than George Hayes. They saw it as a try on in the heartland of the N.U.M.s Yorkshire stronghold, and if it were to be accepted, the inevitability of the Cortonwood closure would open the door for a flood of closures on similar grounds in all the other areas, and other coalfields. Sir Norman Siddall, the man Ian Macgregor succeeded as N.C.B. chairman, had a detailed knowledge of the whole Cortonwood scene. He remains convinced that some one told George Hayes to close that pit. He said, "I don't think it was Hayes who made that decision, at least he was put in the position where he had no alternative". That is probably as clear an indication we are likely to get. So it appears it was the Government who wanted the confrontation. Siddall said; handled properly and intelligently there was no need for a damaging conflict. The industry could be stabilised, and there was no serious problem over the reduction of manpower, because men were leaving the industry at the rate of about 700 a week and pits were being closed with little or no fuss. The Government didn't seem bothered about the cost of the strike. Money was no object to the police with overtime and every means of transport, cars, vans, buses, trains and even airplanes. The cost was estimated at £2 million per week. It was also estimated that the strike cost £5 billion with N. Tebbit saying, "It was worth every penny". We all know the part the police played, but apparently Macgregor wasn't satisfied with their work, for in his book, "The enemies with in" he said; "I wish I had some of my scruffy, sometimes ill disciplined sometimes loud mouthed American police by my side in this country, and some of the curious ways of the law to back them up". So he wanted it over quickly, and thought it would be. Had it not been for the miners support groups, he would have achieved that. 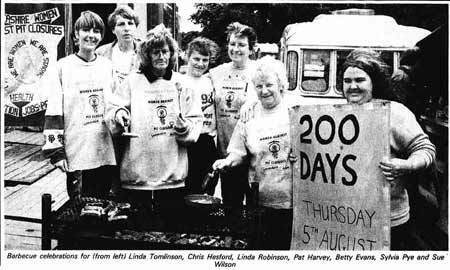 The women's support groups in every mining area, and other support groups in towns and cities through out the land also made a crucial contribution. Some are still active today. The hard heartedness of a Government that would see children starve in pursuit of its policies, only made the women all the more determined. There is no doubt that without their magnificent effort, plus the generosity and hard work of other miners support groups through out Great Britain and overseas, the miners would have been starved back to work within weeks. Trades Unions, The Labour Movement, Community Groups and millions of individuals rallied to the cause to bring in money, and clothing to sustain the miners and their families during that epic struggle. Now nobody commits themselves to extreme poverty for long periods of time lightly. However, strongly held beliefs to save pits, jobs, and communities lead to this determined action. For when a community dies, the effect is more rapid, and far more devastating than when a factory closes. Of all the old industrial communities such as Shipbuilding, The Docks, Steel and Chemicals, it is coal mining that has retained much of the spirit of community, with interlocking relationships and inter-dependence on one another. Mining carries particular, if not unique risks to those who work in the industry. They are far more dependent on each other's ability, courage, commitment and trust than in almost any other occupation, and this engenders that special quality in mining communities, and when this is under attack, regardless of its origins, the emotional response is understandably profound. Add that, to the spread of mass unemployment and hopeless horizons that stretch out in front of young eyes, it becomes easier to appreciate the trauma that hits coalfields when official announcements are made to close pits. 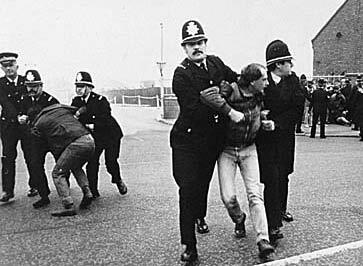 That's why the determination of miners and their families, particularly in Scotland, the North East, Yorkshire, Wales and Kent resisted the forces against them, including the State, Police, the Courts, Sequestrates and the reduction of civil liberties to striking miners and their supporters.